The following is the caption by Elizabeth McCausland accompanying the original 1939 edition of Berenice Abbott's Changing New York publication. 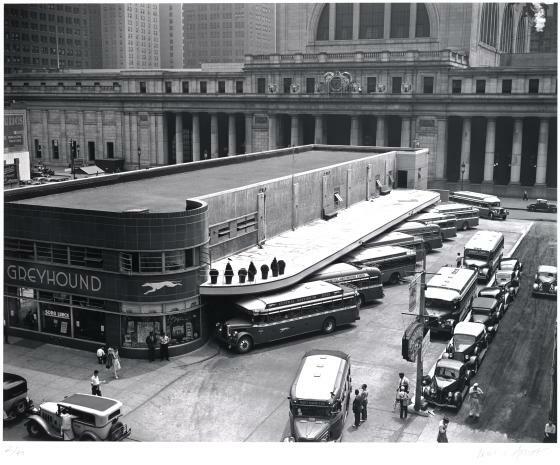 Characteristic of the flexibility and small overhead expense of bus lines as against rail transportation are the several terminals in the midtown district, some specially constructed, some in the ground-floor spaces of large office buildings. 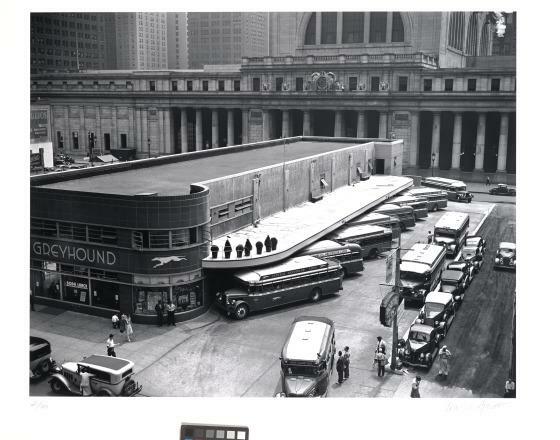 Elizabeth McCausland, caption for “Greyhound Bus Terminal,” in New York in the Thirties [former titled: Changing New York], (New York: Dover Publications, Inc., 1973; New York: E.P. Dutton & Company, Inc.,1939), plate 57 (np). Explore the archive of images from Berenice Abbott's Changing New York project at the New York Public Library. Learn more about the artist and her work. Read a brief biography of Berenice Abbott from NMWA. Check out the residence and studio of Berenice Abbott and her partner Elizabeth McCausland.